We headed down to Hecksher Playground at Central Park a few weekends ago to enjoy some early-fall weather and family time. This is definitely one of our favorite Central Park playgrounds... there is so much to do it can really be enjoyed during any season (although the summer is our fav!). Gabe opted for the swings while Noah went for the giant slide. We had a little picnic lunch, played in the sand, rode the tire swing, ran through the castle, and ended with a little family photo shoot... since for some reason we ended up wearing coordinating colors! We headed down to the river for the annual Little Red Lighthouse Festival a few weeks ago. We've never been for some reason as long as we've lived here, but I was determined to get the kids down there this year, even if it meant hauling the double stroller back up 3 serious hills by myself! It was THE perfect fall day and even after a few bumps in the road (i.e. realizing almost all 3 of my stroller tires were almost out of air on the way there and Noah falling asleep on the way only to say that he wanted to go home as soon as he woke up when we finally arrived) I was glad we went. We had a little picnic, decorated a lighthouse cookie, did some hula-hooping, and enjoyed a reading of "The Little Red Lighthouse and the Great Gray Bridge." Fun was had by all. at least someone was happy we went! Time is just flying by (so much that I didn't even get a chance to post a 5 month picture!) 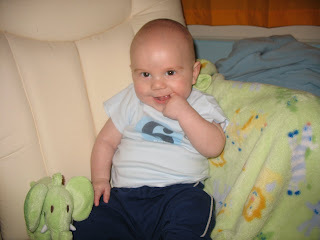 and I can't believe that Gabe is already 6 months old. We had a little photo shoot with Noah's old 6 month t-shirt so we could compare him and Noah at this age. I am loving this age right now. He's finally starting to take real naps, he's giggly and smiley whenever people are paying attention to him, not quite mobile so he can't get into Noah's toys yet (dreading this! ), and he loves to be held and cuddled. I'm suspecting a tooth any day now... we've had a few rough nights this past week but he's a trooper. so happy in this thing!